I went to the UN Irish Pub in Chiang Mai for lunch a week or two ago … and saw on a handbill posted above the men’s urinal (great place for notices!) that the Wallabies (Australia’s Rugby Union team) would be doing battle with New Zealand’s All Blacks on 27 October. And then I found that the match was to be played in Yokohama – a brilliant bit of marketing by the Wallabies’ and All Blacks’ marketing people, as Japan’s rugby scene is small but growing rapidly. A website search revealed that, according to Viagogo, there were only 107 tickets left for this almost sold-out match. I paid a Full-back’s ransom for a ticket that I thought would offer a good seat … only to find on the day of the match it was tucked behind the goal posts, that there were scores of seats still available, and that Viagogo had charged me more than double the actual price of the ticket. I subsequently found out that Viagogo is a company about which many people have complained – so Buyer Beware! And never use Viagogo. See www.trustpilot.com/review/www.viagogo.co.uk for some reviews and comments. An overnight flight on an almost full aeroplane with lots of fortunately well-behaved children saw me staggering zombie-like around Shin Yokohama after seamless passage through Customs, Immigration and two high-speed trains from Narita airport to my hotel. I had Googled various maps and railway station YOU ARE HERE maps to find where the hotel was located. I need not have worried, really, as the forty-two storey round tower of the Prince Hotel dominates the whole of Shin Yokohama, and is just a short stroll away from the Nissan Stadium where the rugby was to be played. Because of the structure for safety, the building swings slightly in strong winds … Please be assured that the hotel is safe even if you hear noise in the guest rooms. I love international Rugby Union and this probably stems from the days when I was the totally incompetent Captain of the Third U15 XV at my school. My team came closest to winning when we were defeated by 32 points to 3. My elder brother’s nickname was “Granny” and as a result of one or two late tackles I made on the field (too scared NOT to tackle and too scared to miss) where I almost missed the opposite player’s body but somehow grabbed him by the boots, I gained for a short time the nickname of “Granny Bootstraps”. I did not know then – and do not know now – all the rules of the game, but to me as an adult aficionado it is a game that is almost balletic in nature, where precision timing and muscle power are balanced with foot and hand skills, and where ferocious bone-grinding action is contrasted with absolute immobility as the Half Back waits for the ball to come from a scrum and while he determines where to toss the thing. There was a crowd of 46,000 people at the game (in a stadium seating 72,000) and most spectators were Japanese, with occasional Kiwis, Australians and French supporters tucked into the crowd. The Kiwis had the game won, I think, even before their pre-game haka. My hotel had merchandise stands selling All Blacks flags and Japanese Rugby Brave Blossoms (their national team would certainly have to be brave to sport such a name!) shirts. At the stadium entry gates young people handed out free All Blacks flags and TRY! Cards printed in black and white. Inside the stadium there were many more stalls selling even more All Blacks merchandise and opportunities to be photographed in front of huge banners bearing photos of key NZ players. Australia’s sole contribution to the international scene seemed to be a Four and Twenty hot meat pie stall. Although there were young women prowling the stands with kegs of beer strapped to their backs and pumping out fresh draught beer to punters where they sat, few seemed to be too boozed and the stadium seating area was not awash with spilled beer as it has been at other sporting venues I have visited. The game was exciting and it was interesting to note the good manners of the crowd: surprisingly quiet most of the time, except when a strong tackle was made by either side. At those moments the crowd cheered and applauded – the sound of the Sumo wrestler hitting the ground could not have been more popular. When a try or a conversion or penalty goal was scored by either side, the crowd was generous in its applause. Final score? New Zealand 37, Australia 20. Really should have had more meat pie carts there. In the streets of Shin Yokohama and Yokohama itself are squadrons of old men – no women – wearing Hi-Vis jackets with LED lights that flash once night falls, wield flashing batons to help people cross the streets, and there are “Greeters” in railway stations and elsewhere who bow to passengers and wish them a pleasant journey. I am not sure which job I would rather have. 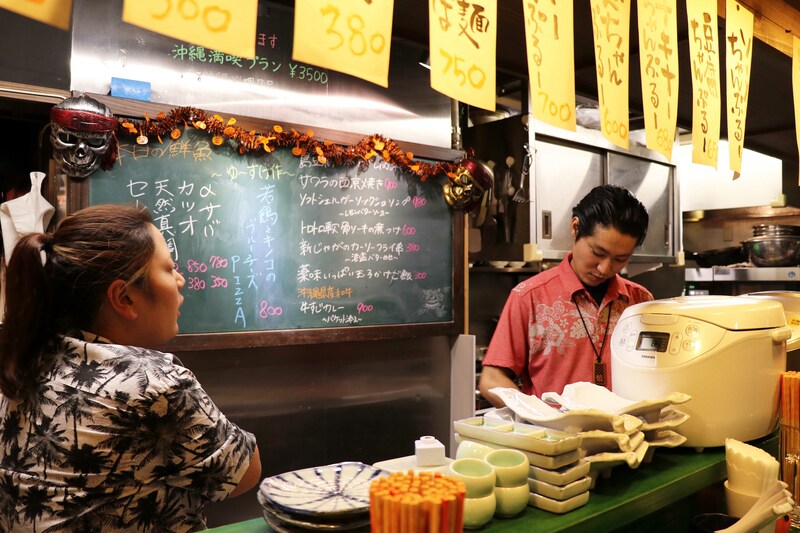 Just down the road from the Nissan Stadium is the amazing Shin Yokohama Ramen Museum – two or three storeys of shops and restaurants featuring all the different sorts of ramen noodles served in the various Japanese provinces. I had a very pleasant meal of mystery lumps in thin noodles with floating bits of something on the side, and a glass of sake on ice, at the Ryukyu Shinmen Tondou, which served Okinawan-styled ramen. In this restaurant people were quite casually dressed, but on the streets during business hours the dress code is still pretty rigid: You can wear any coloured suit at all, so long as it is black. The Japanese “salaryman” – white-collar office workers who traditionally show immense loyalty to their employers, go drinking heavily at night, stagger home and sleep it off and stagger off to the office next morning – used to be uniformly dressed in black suits, white shirts and incongruously sober ties. This seems to be changing a little as I saw a few daring souls in black on black pinstriped suits, one man in (gasp!) a grey suit and even one in (horror!) a brown suit! Perhaps these brave blossoms are not actually “salarymen” but are instead self-employed … or soon to be self- or un-employed. 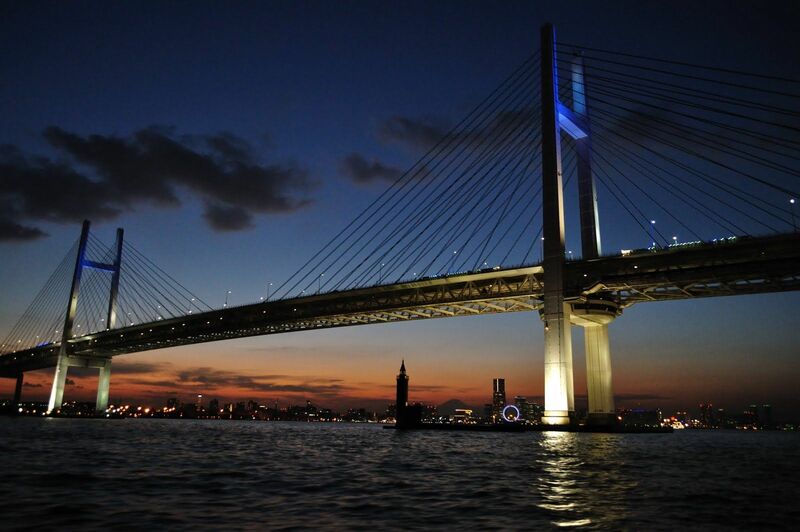 Shin Yokohama – where the Shinkansen or Bullet Trains arrive – is a short subway ride from Yokohama. I tried to be clever by buying a full-day subway ticket, thinking this would be the most economical way of getting about for a day. Well – if I had gone up and down the two subway lines all day it would have been … but the two subway lines link up with the many Japanese Rail lines I had to use and where the Day Pass was not valid. Yokohama was one of the first Japanese ports to be opened for foreign trade – in 1859 towards the end of the Edo Period of 1603 – 1867. US Commodore Matthew Perry was instrumental in the signing of a trade treaty. Not much later the dreadful but apparently fictional Lt Pinkerton arrived in Japan on his way to seduce Cho Cho San – or Madame Butterfly – in Puccini’s opera set in Nagasaki. A more popular performer in today’s Japan is forty-seven-year old comedian, actor and winner of the Japan Academy Prize for Most Popular Actor, Okamura Takashi. His All Night Nippon Kayo Festival 2018 was held at Yokohama Stadium while I was there, with huge crowds queuing for tickets very early Sunday. 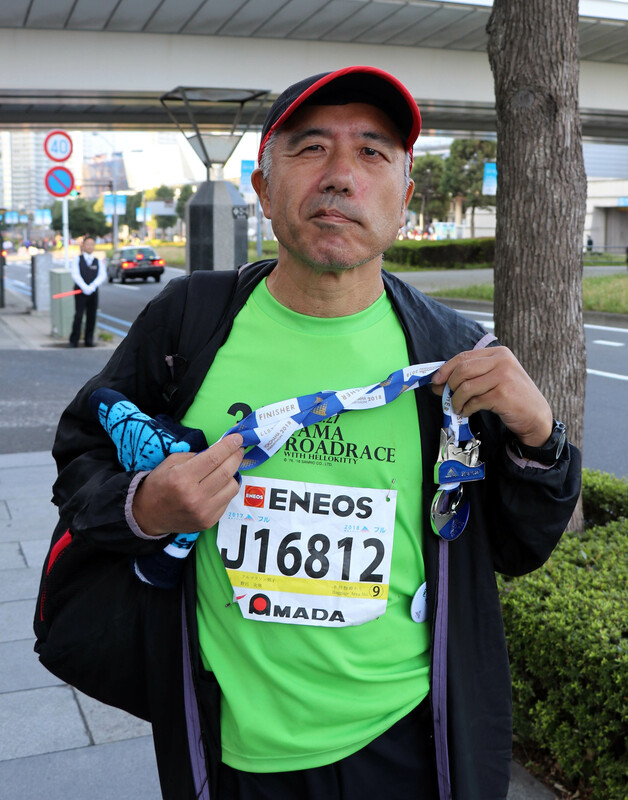 The Yokohama Marathon was also held the Sunday following the rugby, with over 6500 runners taking part in the race around the lovely Yokohama docks area. The scenic Red Brick Warehouses – formerly customs houses and storage depots and now a collection of restaurants and galleries – (see www.yokohama-akarenga.jp/en), a huge Ferris wheel and the spectacular Yokohama Bay Bridge dominate the area. A special “Smart Illumination” festival of lighting installations was scheduled to happen soon after my visit and various artists were at work installing their creations. The Japanese like to create things of intimate beauty and they like to categorise things – this is the Number One XYZ, that is the number thirty-four ABC. 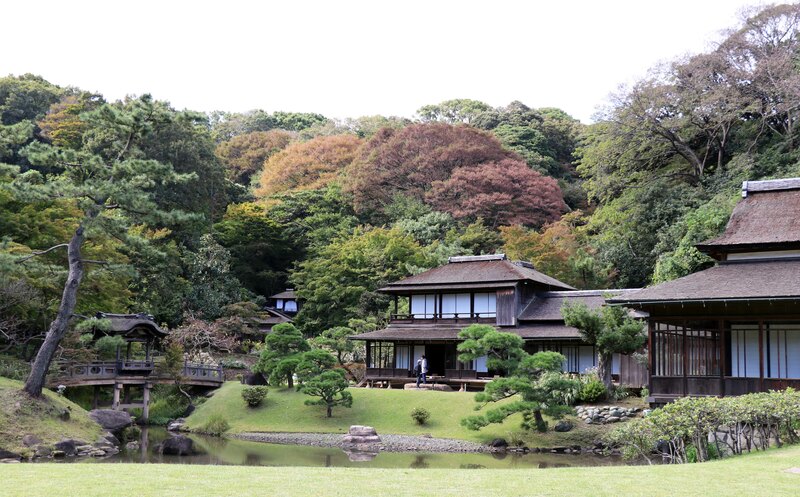 A short train journey followed by another short train journey followed by a short bus ride followed by a ten-minute walk brings travellers to the stunning Sankei-en Gardens (www.sankeien.or.jp), listed by japan-guide.com as No 9 out of ten gardens in the Greater Tokyo area. The featured illustration at LEFT shown an artist capturing the beauty of the gardens. There was also a wonderful display of potted chrysanthemums and bonsais, but for me the best feature was an old, fully-restored farmhouse with a burning fire in the hearth, tatami rooms, store rooms and a feeling that the farmer and his wife and kids might return from the rice fields at any moment. The gardens date from the 1860s and spread over 175,000 square metres facing Tokyo Bay and feature a collection of old houses, farm houses, tea rooms, pagodas and commemorative gates that have been relocated from other parts of Japan and set in carefully landscaped hills and valleys and around ornamental lakes. 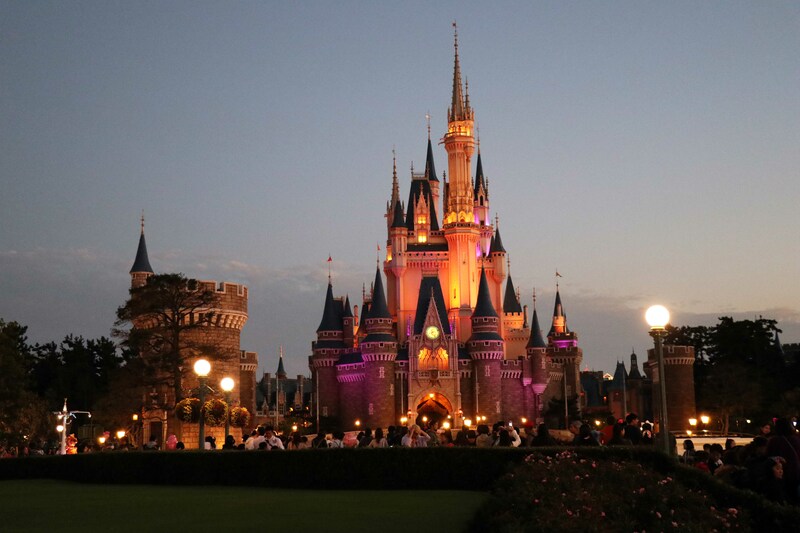 Also featuring lovely lakes and streams and mountains and gardens – some of which are real – is Tokyo Disneyland. I visited on a weekday thinking crowds may be more manageable – but I think half of Tokyo and all of Yokohama had had the same idea and joined me that day. Having previously visited the Disney attractions at Los Angeles and Miami, this one felt very similar, with similar crowds, similar forty-five minute waiting lines for “Pirates of the Caribbean” and similar poor choices of fast food – “dinosaur legs”, curry popcorn, ice creams, and in a nod to the location, pork and bok choi in a bun shaped like Donald Duck’s hand. One thing that WAS different was the crowd with many youngsters dressed in fancy costumes – theoretically featuring Disney characters, but not essentially so. 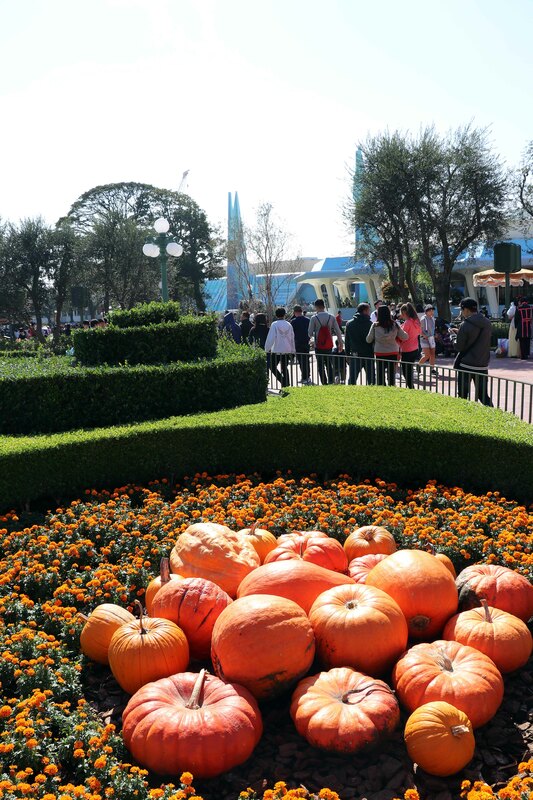 This was a special October treat leading up to Hallowe’en, so there was Captain Hook, about two thousand and one Dalmations, numerous princesses, a few Minnie Meese and scores of people wearing Mickey Mouse ears or tinted spectacles with Mickey Mouse ears. The Grand Parade was loud and raucous and fun, but I wondered when Mary Poppins, Chip ‘n’ Dale and Winnie the Pooh became Disney characters. Perhaps in my old age – and without a couple of wide-eyed kids in tow – I am getting a bit more cynical. While the “rides” I went on were fun enough, it was annoying to have to queue for almost an hour for a twelve-minute thrill in the Star Wars ride, and to face hundred-metre queues to buy a hot dog, and to have almost as many shopping venues as food outlets for those who wanted to buy Goofy dolls, pirate hats and plastic swords, or plastic or stuffed toys of all shapes and sizes. I waited until sunset to see the lights on Sleeping Beauty’s Castle – or was it Cinderella’s Fairy Tale Hall – but did not wait for the fireworks – my feet were fireworks enough after a day of walking, waiting, watching and waiting a bit more. I visited an onsen back in the real world of Tokyo where I was able to scrub away the grime of the day and soak in ever-increasingly hot tubs of water before plunging into the cold baths, showering and returning to my gently swaying hotel. Apart from being a Japanese pop song by the Southern All Stars, it was Sayonara Baby for me after a very pleasant few days in Yokohama and Tokyo. According to various sources, Japan has a population of 127 million squeezed into just 378,000 km2, giving an average of about 335 people every square kilometre. Thailand offers just 136 people for every square kilometre, and my birth country of Australia – reportedly the oldest, flattest and driest inhabited continent, with the least fertile soils – has just three people per square kilometre. Perhaps it is all those people in Japan that force it to be so efficient. When I left my hotel I took the 0719 Shinkansen from Shin Yokohama. It departed at 0719 and linked up with the 0751 Narita Express at Shinagawa. The Express left at 0751 – not 0752 or 0750 – and arrived at Narita Airport at 0901 as scheduled. Again the transit through check-in, Immigration and security was fast and painless and by 0925 I was sitting in the ANA lounge with a glass of bubbles in my hand! 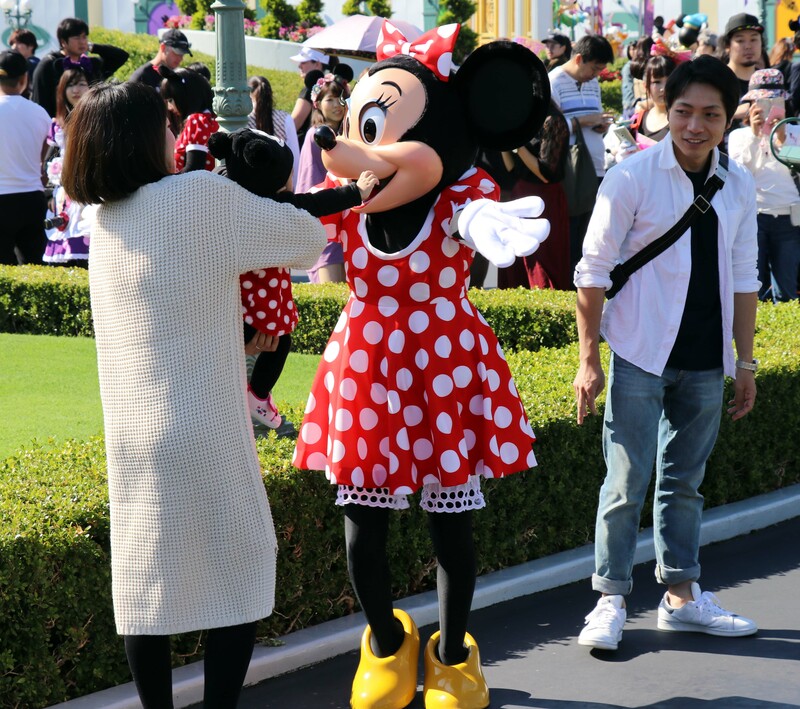 It was a funny but fun few days – a great game of rugby, a delightful find of a Ramen Museum, a Marathon, some contemporary art, a hot tub soak … and a chance to be hugged by Minnie Mouse. This entry was posted in Contemporary art, Festivals, Japan, Onsen, Rugby football, Train travel, Trains, Travel. Bookmark the permalink. Thanks Darcy! Yes – it is great to share – and I hope that my next visit to Hobart is slightly longer than 24 hours! I love trips that are short but full of all sorts of things. This sounds like one of those!! Yes Lynda – as I said – it was a fun but funny journey! Great post! Vist Busan, Korea next time. Thanks for the positive feedback – and, yes, I’d love to come to Busan to see the Bandits in action!